The Wonderlic Personnel Test is administered to prospective employees during the hiring process. It measures cognitive ability so that employers can match individuals with jobs. The developers of the Wonderlic have collaborated with the US Department of Labor to determine what level of cognitive ability is appropriate for each type of job. The philosophy behind the WPT is that every individual can be ideally matched to an occupation that makes the best use of his or her intelligence without being beyond his or her abilities. The goal of the test, then, is not to provide a definitive measure of intelligence, but to determine whether the abilities of the candidate are suited for the job. The questions on the WPT include vocabulary, visual identification, math word problems, and brief logic statements. 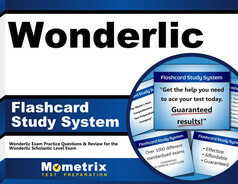 The Wonderlic Personnel Test can be taken in only 12 minutes, and is administered by the hiring organization on site. It may be administered and scored with pencil and paper, on a personal computer, or on the internet. When the internet is used for the administration of the WPT, exam results are emailed to the organization. There is no pass or fail on the WPT; individual scores are considered with respect to the position for which the individual is applying.